Another big transition for Riverbed is something that we’ve been working on ever since I walked in the door: Building an efficient and agile enterprise architecture for the hybrid enterprise. What does that mean? Simply… that we have developed a set of strategic principles that govern our technology investments—all designed to strengthen and enable our business, reduce risk, and help us grow sustainably and profitably over the long term. 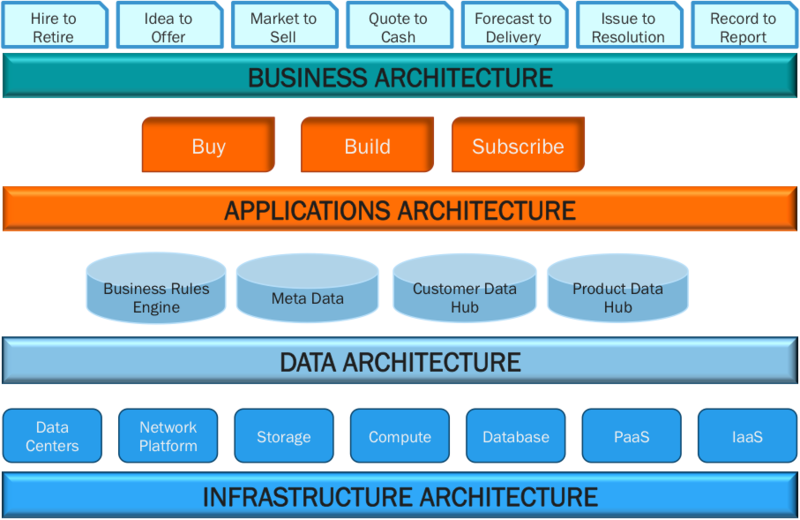 There are four primary levels to enterprise architecture: business, application, data, infrastructure. In the diagram below you can see how this lines up relative to the industry view of architectural layers and they all interoperate to deliver the end state capability, service, or analytics. For example, one of our key enterprise architecture principles, or guideposts, is simplification. In practice this means vetting every new investment proposal – whether for software, hardware, or service—with an eye to reducing IT complexity. Our recent efforts to consolidate on a single collaboration platform—versus a collection of overlapping ‘point’ solutions—reflect this strategy. Another guiding principle is to stay constantly aligned with Riverbed’s business priorities. Because these priorities change, our operating infrastructure needs to be capable of adapting quickly. This is why we designed our IT architecture using flexible service-oriented architecture (SOA) principles and built an ‘integration engine’ that facilitates deployment of new business capabilities. Taking an enterprise-level approach to IT investments also helps contain costs and makes it easier to control access to our business systems and protect critical data. All of this translates into reduced business risk, another important goal of our enterprise architecture. Building for scale is now truly a combination of art and science. Riverbed’s enterprise architecture will always be a work in progress—which is how it should be. But by establishing sound IT governance practices, we’re moving into the future with confidence. In upcoming messages, we’ll share more about the journey ahead and the strategic IT roadmap that will help chart our course.